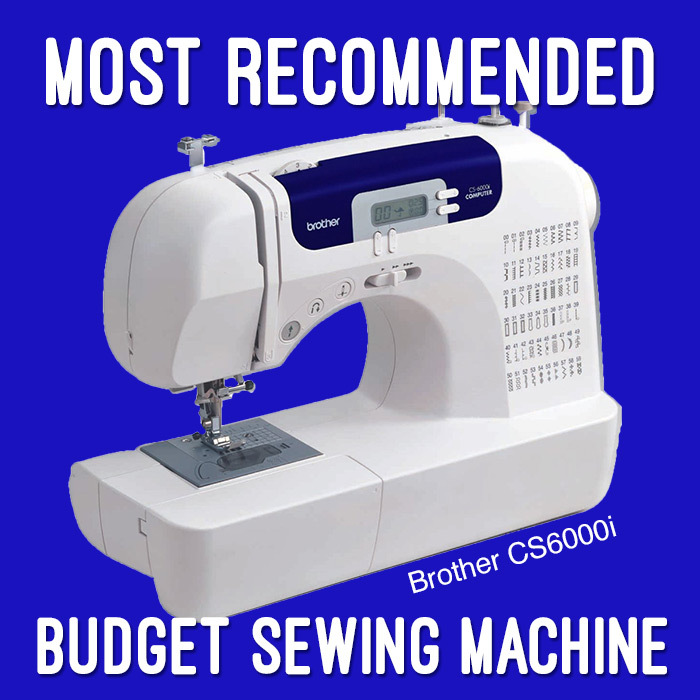 Why is this machine always recommended as the best budget sewing machine? In short, this machine just works like it should, has just enough features to make it fun and convenient, and is the right price. It’s hard to get a perfect sewing machine below $1,000 but that just isn’t in the budget for most people. My daughter has this machine (I bought it based on all these recommendations) and we couldn’t be happier! We wanted a machine that she could use for years and this is it! I think it’s important to note that Brother makes many different models of budget sewing machines. I have a different model that was a bit cheaper than this one and I really wouldn’t want to even donate it for charity it’s so terrible. It’s no fun to sew on because it’s always getting jammed or the tension is off. So be aware that even among the same brand the quality and reliability of a machine can vary a lot! The model I am recommending is the Brother CS6000i . Do you have experience with the Brother CS6000i ? UPDATE: I’ve received a couple comments inquiring about what “most recommended” means. Here is one reader’s email and my response. Q: I tried looking on patternreview.com for info on the Brother cs6000i. There were NO reviews! How can it be the most recommended machine. ..
A: Hi Cherry. Great question! I thought I had covered it in that post but I must not have been clear enough. I asked a few times on my facebook page and had hundreds of responses and this one was by far (like, 90%) the highest suggested! If you look on the Amazon reviews it is definitely one of the best rated as well. I don’t know much about Pattern Review but from what I do know most of the women on there are pretty serious and have more expensive machines but there does appear to be at least 27 reviews on that machine on Pattern Review. You can read them here. You can read the Amazon.com reviews here and see the response people had to this post when I posted it on facebook here. Hope that helps you make an informed decision! I’ve had several sewing machines over the years and learned to sew on a mechanical Brother machine in the 70’s. I bought my Brother CS6000i with a very limited budget and a time sensitive Christmas gift to sew (of course, I waited until the last minute to start assembling it!) I have put my machine through its paces. What swayed my decision (apart from the name and all the specialty/heirloom stitches) was the accessory package. My CS6000i came with a free-motion foot (generic ones are $12) , a walking foot ($30-40), applique foot, zig-zag foot, automatic buttonhole attachment, button sewing foot and zipper foot as well as several sewing needles (this machine has twin-needle capabilities which is great for top-stitching and finishing knit projects) and the other Tchotchkes you would expect like extra bobbins, second thread spindle, seam ripper and screwdriver. While there are limitations, for my kind of sewing it is fabulous. I paid $130 for mine with free shipping from Amazon with my Prime membership. What a great deal! I have a cheap Brother and it’s terrible. Not all Brothers are equal, for sure. I’m a very, very beginning sewer (at the age of 61, believe it or not), and my best friend, who is a prolific seamstress recommended the Brother CS6000i for me to start with. She has well over 50 years experience sewing, and has one of the CS6000i machines to back up her bigger, more expensive Singer machine. Don’t feel bad. I have never been a sewer myself but have decided now I want to be and Im 62!! i have t 2 little grand daughters now. There are so many things to make. I can’t wait to order my machine and get started! I have this sewing motion and love it as well! After 39 years, I had to get a new machine. Since I hate change, all I wanted was a machine that would just sew forward and reverse. My husband finally convinced me to get the Brother CS6000i, and after I got it I absolutely love it! It’s extremely easy to use , cost me $151 on Amazon, and, besides sewing for my grandchildren, I used it to recover my daughter’s recliner chair! I’m a seasoned sewer but felt this was easy enough for a beginner to use, so I bought one for my daughter and one for my daughter-in-law and they love it! I have no qualms recommending this machine. I got my CS6000i for Christmas 2010 as a secondary machine. I’ve used it for quilt piecing, quilting, garment sewing, cloth diaper sewing, mending Carhartt bibs, etc. My son even pulled it off the table and onto the floor one day a couple years ago, but it still works fine. I’ve never had it serviced and have rarely cleaned it. The throat space is little (harder for quilting), but I love my automatic buttonholer and it’s done pretty much everything I’ve asked it to. I usually sew about 1-2 hours a day in the winter (less in summer when I’m outside more), so I’d say the machine has gotten a workout. Definitely a good budget machine. My other machines were a 1983 Viking and now a Juki TL2010Q. I bought my Brother CS6000i from Amazon in January 2008 and it has served me well. I love it. I’ve thought about saving for a “nice” machine but really, my Brother has been so reliable I don’t see the point in spending more money. I have sewn about anything you can imagine on it, purses and bags with lots of layers, clothing (including knits) and quilts (both piecing and machine quilting). I sew on it at least 4 or 5 days a week, usually for an hour or more… whatever I can fit in, as often as I can. I recommend this machine to everyone who asks and not one has been disappointed. I have this machine and have used it daily for over 2 years and have never had a problem with it! I’m a quilter so I sew mostly with cottons. I don’t know how well it would do with heavier materials, but I have my old metal Kenmore for that (my first machine). For a cheap, reliable machine, I certainly recommend this one! I love my CS6000i Brothers machine. Have had it for about 6 or 7 years and it is wonderful for anything from a minor mend to quilting a queen size quilt. My granddaughter who is 12 years old learned to sew on this machine. Well worth the money. I too have the Brother CS 6000i….paid less than $150.00. It is awesome. Came with many extras and has been a charm. Purchased from Amazon for less than the repair bill on my expensive machine. Love it! I bought the brother above based on your recommendation and I love it. I’m new at sewing and it is easy to figure out. I really like it. Thank you for the review. I have had this machine for several years. Have sewed most of everything on it, shirts, blouses, square dance dresses and quilts from piecing to quilting queen size quilts. My granddaughter has learned to sew on this machine with no problems. I love it and have never had any problems with it. Would recommend it to anyone. 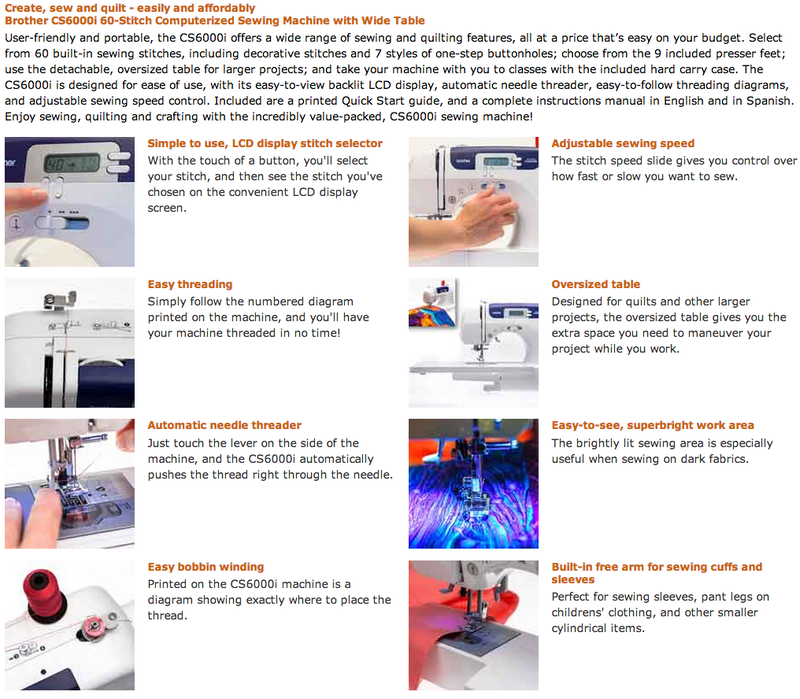 What wonderful reviews for this Brother sewing machine! I do have one question for all those who have & use this machine: Have any of you sewn jeans/denim on it? I don’t have the money for a “fancy” machine, but love to up-cycle clothes ( take jeans and turn it into a skirt for example) and my singer just struggles! I also have a problem with more than two layers of anything but cotton with my current machine. Any advice would be wonderful! i have this machine two years now works like new I love it!! !and highly recommended it. I hope this isn’t a mistake? What do you think about this machine? I wish when people did sewing machine reviews they would stress , that there is a big difference in machines bought at Amazon, and retailers like them, then the machines bought by dealer. Most dealers won’t fix machines sold by retailers. A good sewing machine repair person will fix any machine. Some dealers will only fix machines you purchase at their store. I liken it to getting your car worked on at the dealership. I want to buy a new sewing machine.pls let me know from where I can easily by this one in peshawar Pakistan. Hi, sorry, I don’t know where you could buy this there. Best of luck searching!